A bow is a semi-flexible strip of wood or other material, which is bent and put under tension by a string stretched between its ends. By pulling back the string a lateral force can be applied to an arrow or bolt which despatches the missile at high speed when released. Historically bows were made of a single piece of wood, the English long-bow being made of yew. 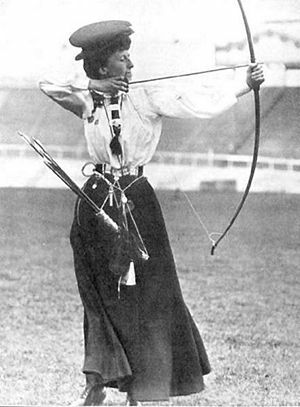 However, compound bows made of laminated strips and pre-shaped into an arc have proven to be more powerful. This page was last modified on 4 November 2008, at 23:08.